Cook Islands lizards are geckos and skinks. What is the difference? How did they arrive? Geckos are small, night-active lizards with a dull skin, wide toes and large bulging eyes. The gecko shown here is the Polynesian Gecko (Gehyra oceanica, Moko Ngarara), the largest Cook Islands gecko with a total body length (TBL) of near 20cm. Of our eight gecko species three have a voice. 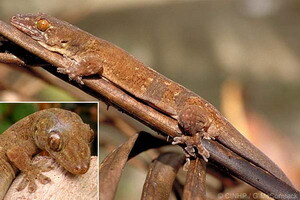 The name ngarara imitates the low growling call of the Polynesian Gecko. Our loudest gecko, the House Gecko (Hemidactylus frenatus), has a very loud 'chi-chi-chi-chi-chi' call. Geckos can rapidly change their colour to camouflage themselves. The small Mournful Gecko (Lepidodactylus lugubris) is almost uniformly cream on a white wall, and is a rich patchwork of black, brown, and cream in the wild - it is also our third voiced gecko. Geckos are preyed upon by birds and rats, and some large geckos eat small ones. They can drop their tails to distract a predator, and some, like the Polynesian Gecko, can also slough off large pieces of skin as a distraction. They regrow lost tails and skin. Geckos have large eyes and a very wide-opening pupil for excellent nocturnal vision. They feed on insects and spiders, and some species also eat and lick the flesh and juice of ripe fruit. They hunt on buildings and on trees and shrubs. Geckos intrigue us by climbing smooth walls and windows, and by running upside-down under ceilings. They achieve these feats by having enlarged toe-pads with countless plates (lamellae) of fine adhesive hairs. Females lay one or two eggs in a secluded place where they form hard shells, and the young hatch in a month or two. Four of our gecko species have males and females, while four have females only. The females of the unisexual species develop their eggs without being fertilised by sperm. Native gecko species are abundant in Asia and decline eastward into the Pacific. There are several native in Fiji, and a few native in Tonga and Samoa. In the Cook Islands most of the eight gecko species arrived as accidental tourists on early Polynesian canoes, and one, the House Gecko, on a boat in the late 1980s. At most two might be native having arrived on drifting objects without the involvement of people. Skinks are small, day-active lizards with a glossy skin and slender toes with sharp claws. Shown here is the Moth Skink (Lipinia noctua), which lives under objects on the ground and in holes in trees. It is easily recognised by the yellow diamond on its neck which extends as a stripe down its back. It is about 10cm TBL. Skinks divide their time between basking in the sun, and hunting insects on the ground and in the vegetation. They are hunted by birds and rats. They have acute eyesight and they escape by very rapid movement. Like the geckos, they can discard a wriggling tail as a distraction. Our six skink species have males and females. The females lay one to four eggs in a secluded spot. 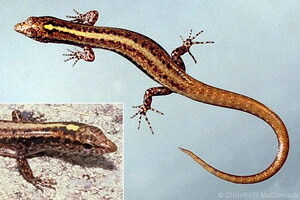 One local species, the Moth Skink, is very unusual in giving birth to live young. Four of our skink species are very widespread, one is restricted to Pukapuka, and one is restricted to Rarotonga. Although there are native skinks eastward in the Pacific to Fiji and Tonga / Samoa, the six in the Cook Islands, and the four of French Polynesia, probably all arrived as accidental tourists on the early Polynesian voyaging canoes. First published in the Cook Islands News, 15 March 2003. McCormack, Gerald (2005) Geckos and Skinks - Accidental Tourists. Cook Islands Natural Heritage Trust, Rarotonga. Online at http://cookislands.bishopmuseum.org.